nScale.net - Share Your Weathering! As soon as I have the room for it I am going to get a resin printer, I have seen the results from the Anycubic , it excited me . I just saw a GOOD resin printer for 500 bucks, what stops me from just going and buying that? I agree. Pricing themselves out of the marketplace, at least in some sectors. How would you go about that? Maybe just touch a few bristles of an almost dry brush to the car to leave a few flecks? Yes you can do that, that is what is known as "dry brushing" Dip your paint brush in some paint lightly, then wipe the majority of it off on a piece of paper, or paper towel or something that you have handy. Leaving enough on the brush, you lightly brush over the surface which will leave small amounts of the color, in this case silver, on the surface, but it will not leave a full brush stroke of paint. Next you can use either weathering powders or even some cheap pastel chalks. Two colors work great, that's Black and Orange. If you mix these to colors you can get different shades of browns. Once this is done you can apply a coat of Burnt Sienna in the same fashion as you do the white. One nice thing about oil piants is they have a tendency to stain the dull coat and change the color nicely. If you're not after a real rusty roof you can stop here and seal it and call it done. 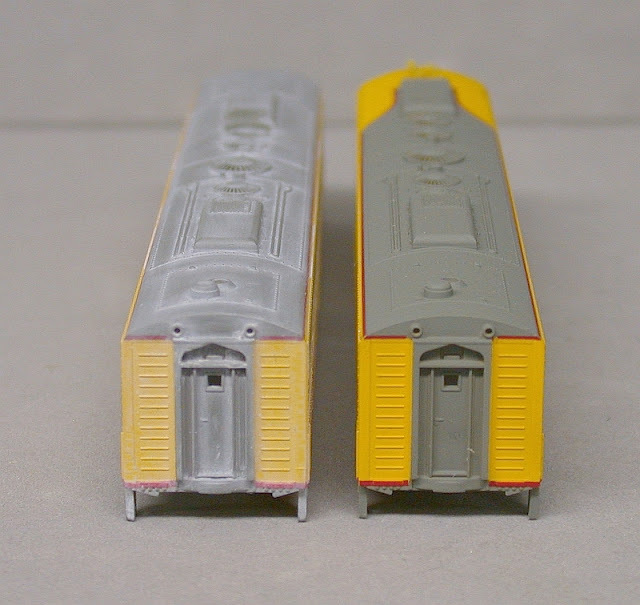 Both of these E8's were faded as described above, sealed and then I applied a coat of dark gray to the top unit and coat of Burnt Sienna to the bottom unit. I applied the colors as I applied the white, then took the majority of it off with a "Q"tip. But unlike the White, I left small traces of the brown in and around small details just like dirt and rust would do in real life. You can also use a brown wash for this as well. Anything to knock down the original color. How much you leave is up to you. The next step is to take a short bristled brush that is stiff. I have taken an old brush and cut off the biggest share of the tip so that only about 1/8" or so is left. This makes a nice stiff stippling brush. Start out with the lighter color of paint, Raw Sienna. Dab your brush in the paint to load it up, you don't want a lot just enough to have some on the end. Start out light then more as you feel comfortable. Start by stippling this on the surface in a random pattern over as much of the roof as you wish. Once this layer has been applied, you can go to the next darker color: Burnt Sienna. Repeat the same application as you did with the Raw Sienna, but do not cover the entire area, stay back from the outer edges and work the darker color toward the center. As one guy explains it "The Pain of the Rust is always towards the center and the rust spreads outward like cancer" This is called "Layering" One color over the first. Always start in the center of an areas you wish to cover, working outwards. This give a natural pattern, heavier in the middle and lighter to outer edges. The Pain is the center and therefore the darkest. If you are satisfied with amount of rust, then stop and let it dry for a few days. If you don't like the way it looks, you can take a "Q"tip or small rag lightly dampened with mineral spirits and wipe it all off ans start over. Since Oil dries slowly it gives you a chance to start over. After the paint has dried, shoot another coat of dull coat over the roof to seal the paint. Now comes the time for the chalks or powders. 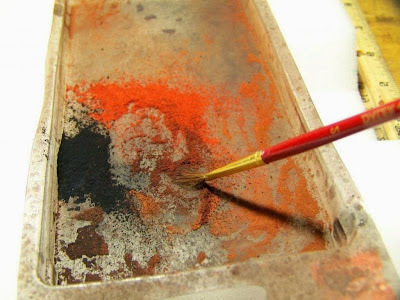 Scrape off some chalk with a razor blade into a shallow pan, some of orange and some of the black. Mix until you get a color you like and then with very soft brush, lightly load up your brush and brush it on the rusted areas. Start light and add more as you feel comfortable with. If you like the results, stop, spray another coat of dull coat and your done. I have seen guys and have tried it myself, that is to apply the paint and then apply the chalks or powders directly into the fresh paint by stippling the chalk in the same method as you did the paint. Then let it all dry and shoot a sealer coat of dull coat to seal the whole thing. Both methods work. Oil paints work the best IMHO as it dries slower, more time to work with it. If your quick enough you can do this using acrylics as well. Here are a few samples of some of my stuff that I've plated with. These are still no where as good as some of the ones that I've seen before. 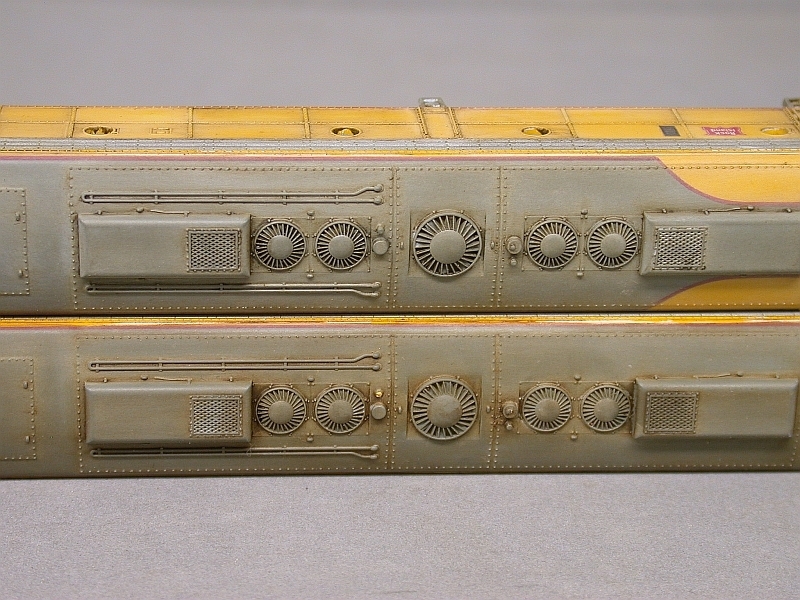 If you go to the weathering shop through the link that Michael posted, you will see some jaw dropping examples. These are the best that I've done so far, but there is still room for improvement. Another tool that some of the guys use is not a brush, but cosmetic sponges that women use to apply makeup. They take one of the edges and tear off little pieces so the surface is no long smooth, but rough and use that to dab or stipple the paint on. For N scale, they can be a little big. Grab and old car and experiment, even a piece of paper or styrene will work. I know that oil paints are the way to go for rust and you just proved this Allen with these fantastic roof shots. Thanks for the tutorial. Anytime Michael, glad to help. I was skeptical with the oils at first, but after playing with them on a few cars and seeing the results, I was hooked! I have also seen how some of the guys will use acrylics for smaller rust spots. I haven't attempted this yet, but will sometime. With a small spot or patch, you can work it faster than a large area so it won't dry before you get it blended out or layers. Thanks Allen! Great stuff! Like I need to start another project, but I might have to visit the Hobby Lobby next to the office tomorrow. Very inspiring! Well you have just a few 2 bay RI hoppers to try it on now! Get after it! I might be calling you this weekend for tips! Haven't heard from you Lynda for quite a while. How's your railroad coming along? Need to start a new thread though. I've painted for years and years military figures (for myself & on commission) with oils. I see you use Winton oil paint. That is a student paint. If you go for the Winsor & Newton artist quality you get much finer pigments, and therefor better results. But regardless of the quality grade paint you buy, stay away from the W&N burnt Sienna. That contains a very grainy pigment, buy grumbacher or another quality brand instead. The Burnt Sienna is from W&N is notorious grainy! Beside that, this is a very good topic and I read it with great interest. Thumbs up. But regardless of the quality grade paint you buy, stay away from the W&N burnt Sienna. That contains a very grainy pigment, buy grumbacher or another quality brand instead. The Burnt Sienna is from W&N is notorious grainy! Good info there Rob, thanks! But I have to mention, when weathering, one tries to make things look dirty, grimy and rusty. So my question would be, would paint that is a little too grainy have any ill effect on something that will be weathered? Or would it enhance it? I've seen guys do it and have also tried it, that is to say when making a rusty roof or a rusty area sometimes chalk is added or mixed in with the paint to give us a bit of texture, so if it happens to be a bit grainy it shouldn't hurt anything. Yes I now what you mean, but.... I try to explain. Oil paint is made of pigment and linseed oil (yes I now there are exceptions). The grainy B-S from W&N, when diluted, breaks apart. If you use another quality brand you can dilute it far more. But on the other hand; you're right. I just find that it is more difficult to control over other brands. Gotcha! That's good to know, thanks for the explanation. An afterburner: If you want texture in your paint try using Talcum powder.